347 pages | 19 B/W Illus. LogiQL is a new state-of-the-art programming language based on Datalog. It can be used to build applications that combine transactional, analytical, graph, probabilistic, and mathematical programming. LogiQL makes it possible to build hybrid applications that previously required multiple programming languages and databases. 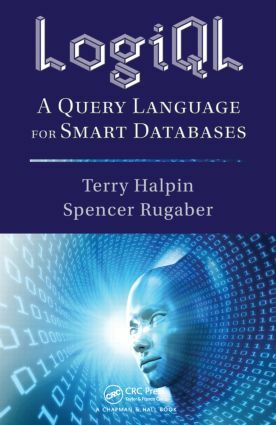 In this first book to cover LogiQL, the authors explain how to design, implement, and query deductive databases using this new programming language. LogiQL’s declarative approach enables complex data structures and business rules to be simply specified and then automatically executed. It is especially suited to business applications requiring complex rules to be implemented efficiently, for example predictive analytics and supply chain optimization. Suitable for both novices and experienced developers, the book is written in easy-to-understand language. It includes many examples and exercises throughout to illustrate the main concepts and consolidate understanding. "I gladly recommend the LogiQL book to anyone interested in databases. … The book is easy to read, contains many examples and exercises, and offers teachers involved in databases and their applications a very effective tool to get students to understand databases and how to program them." "The first mistake people will make is to think that LogiQL is another SQL. No, no. SQL is for accessing data and maintaining data integrity in a relational model. LogiQL discovers and deduces logical relations from predicates by looking at data and a set of predicates that define rules. If you ever worked with the Prolog language, then you know the difference. LogiQL has an extensional database (EDB) and intentional database (IDB). EDB predicates normally are used to hold the facts that you explicitly enter into the workspace. In contrast, the facts populating IDB predicates are computed for you by your logic program. Think of SQL as a library and LogiQL is the research librarian. This is the only book on LogiQL and it is designed as a textbook with examples and tests for someone who wants to learn this tool. Get the software, open the book, and get started." Spencer Rugaber is a computer scientist who has worked both in industry and in academia as well as serving as program director for the Software Engineering and Languages program at the U.S. National Science Foundation. His research interests are in the area of software engineering, human-computer interaction, and cognitive science. He is the author of the article on program understanding included in the Encyclopedia of Computer Science and Technology and of numerous software engineering articles appearing in technical journals and conference proceedings. He is currently a computer scientist with LogicBlox, Inc. (Atlanta, Georgia) and an adjunct faculty member at the Georgia Institute of Technology (Atlanta). Terry Halpin is a professor in computer science at INTI International University, Malaysia, and a data modeling consultant. He previously held senior faculty positions in computer science at the University of Queensland (Australia) and Neumont University (Salt Lake City, Utah). He previously spent many years in data modeling technology at Asymetrix Corporation, InfoModelers Inc., Visio Corporation, Microsoft Corporation, and LogicBlox. His doctoral thesis formalized object-role modeling (ORM/NIAM), and his current research focuses on conceptual modeling and rule-based technology. He has authored more than 200 technical publications and seven books, and has co-edited nine books on information systems modeling research. He is a regular columnist for the Business Rules Journal, and is a recipient of the DAMA International Achievement Award for Education (2002) and the IFIP Outstanding Service Award (2006).